NEW: File Manager / Options: Added the option 'Show log after the selected action is completed'. UPD: Search Result / Toolbar 'Search': A new icon inside the search box was added to indicate that the search was successfully or nothing was found. UPD: The ukrainian translation of the user interface has been updated. NEW: Source folder / Compare method: Added 'Compare only files within the same source and sub folder'. 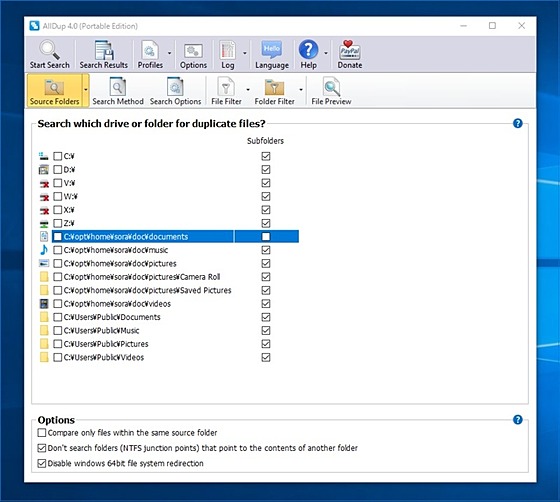 NEW: Search option 'Scan Archive Files': The following additionally archive types can be scanned for duplicates files: 7Z, ISO, CAB, TAR and GZ. NEW: Search method 'Similar Pictures': The new option 'Detect picture modifications' enables you to detect rotated or flipped pictures. NEW: Search method 'Similar Pictures': Added the option 'Compare only pictures with the same file extension'. NEW: Search method 'Similar Pictures': Added the option 'Compare only pictures with the same width and height'. NEW: Search method 'Similar Pictures': Added the option 'Compare only pictures with the same orientation'. NEW: Search method 'Similar Pictures': Added the option 'Compare only pictures with the same aspect ratio'. NEW: Search method: Now you can ignore the seconds from the timestamp when using the comparison criteria 'Create date' or 'Last modified date'. NEW: Options / Search result: Added the option 'External program to open files'. NEW: Search result: Now you can hide groups based on the file selection inside the group. NEW: Search result / Menu bar 'Filter': Added the menu item 'Show groups without selected files'. NEW: Search result / Menu bar 'Filter': Added the menu item 'Show groups with all files selected'. NEW: Search result / Menu bar 'Filter': Added the menu item 'Show groups with some files selected'. NEW: Search result / File Manager: Now you can choose which groups of the search result should be processed: 'All groups (ignore filter)' or 'Only groups displayed by filter'. NEW: Search result / File Manager: Added the option 'Don't process any groups with all files selected'. NEW: Search result / Menu bar 'Select': Added the menu item 'Select all files with a Percent Match greater or equal to a specific percent value'. NEW: Search Options: Added the option 'Abort the search operation after a certain amount of duplicates was found'. UPD: Comparison Criteria 'File Name': The option 'Partial name matching' was renamed to 'Find similar file names'. UPD: The traditional chinese translation of the user interface has been updated.